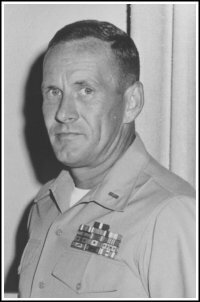 Biography of James E. Mulloy, Jr. USMC (Ret.) Co-Author of WMD Attacks on America! CWO-4 Jim Mulloy is a retired Marine Corps Officer who served thirty-four years. After 16 years of advancement to Gunnery Sergeant: he went from 2nd Lt. to Captain in the next two years. After the Vietnam conflict ended, he was reverted to Warrant Officer-1 and advanced to CWO-4. During his service, he performed in varied Marine Corps assignments: Infantry, embarkation, Vietnamese language interrogation and translator, and finished as a Supply Officer. CWO-4 Mulloy spent all his overseas assignments in Southeast Asia, Japan, Okinawa, the Philippines, and Thailand. Of course he also made a few trips to South Vietnam. After retiring in 1984, he finished his education and graduated from San Diego State University in Southern California, where he now resides. Like Major Stolz, I too initially felt my citation should not be appended. Those events are far removed from my being the technical consultant on this book. Also, Medals such as these represent highly personal actions taken in situations not to be presented lightly. However, I spent many years in the Marine Corps and that service will always be a central foundation of my identity – I cannot escape that. My photo does show the Medal, and my citation is already a matter of military history posted on the Internet along with others who received like awards. I am extremely proud of the Marines who were with me near Chu Lai, during Operation Starlite in August of 1965. That I was able to contribute to saving the lives of fellow Marines has always been one of my proudest thoughts. Vietnam was also one of Americas "Finest Hours" for which much credit was denied. I acquiesce to simply honor my fellow Marines from H&S Company, 3rd Battalion, 3rd Marines with this description of what they were faced with in those days so long ago.